Felix leaped into our bedroom with the enthusiasm borne of one who is going to a party today. We kitted him out for play and wrapped the latest Lego kit in bright birthday paper. Felix festooned his friend’s card with words and pictures and then, all in an instant, he and Phil were gone. And my daughter was gone with them. She had a present to buy too. She must find something suitable for a friend, for she had her first invitation to a senior school party. The present bought, we discussed The Outfit. Rummaging in her wardrobe, we found the perfect thing: a woollen top with crotcheted neckline in blues and violets and aquas, and a lovely violet shrug to match. A quick trip to the shops bore more fruit: the most perfect pair of pale green brocade pumps and violet leggings. We perused the shop’s hair ornaments. Maddie chose a pair of brightly coloured butterflies on clips. Made of gauzy nylon, coloured like the rainbow and dusted with sparkle, they were a flamboyant accessory which made the outfit. Felix came home, bounding about like some chimp escaped from the zoo. He was delighted with his morning, and full of fast food; and he bore some very special party favours. He had returned home with 100 potential water bombs. For those of you not in the know, these are very small balloons which ones fills (using a blokey technical attachment) with water and drops from a great height. There was a short interlude in which he solved the problem of how to fix the filling nozzle to a litre coke bottle full of water. And then he disappeared, stationing Maddie in the garden as water bomb sentry. It was not long before he was experimenting from the first floor window, exploding ever larger and more extravagant water bombs on the patio below. Meanwhile, I kidnapped the sentry. It was time to get ready: we styled hair and the sparkly butterflies were clipped into place. We primed the satnav and headed off for the party. The thing about satnavs is: you never quite know where they are going to take you. Today we found ourselves going through Sonning, on this, one solitary sunny day in the midst of all the torrential rain. And our eyes grew wider and wider as the lanes grew narrower and narrower, the houses more and more palatial. The lawns were impossibly green and poppies bobbed in the hedgerows. This was the England you saw in all the Marple mysteries. Affluent England, spacious England, the greenest and most pleasant of lands. We skirted the willowy Thames and ooh-ed and aahed. We passed a public school where young men were playing cricket in pristine whites which positively glowed in the home counties sunshine. After the most impossible number of windy-bendy-twisty-turny emerald hedgerowed lanes, we arrived at the village hall in question. An arts-and-crafts village hall in the centre of farmland, we eyed the ponies grazing in the field opposite. And then we walked to the door. And suddenly, she was gone. Disappeared into a dark fairy-lit hall without a backwards glance. And I was alone with my satav. Returning to the car, I observed the two sparkly butterflies neatly placed on the seat. A reversed decision: a little too flamboyant for today, perhaps. My daughter already makes her own decisions. Posted in Shrewsday MansionsTagged family. kids., partiesBookmark the permalink. Maddie’s outfit sounds really pretty. The satnav journey was almost like going off on a magic broom. I was a wuss. I came home. Phil started off about 20 minutes to collect her. In retrospect I wish I had just brought my camera and driven round: the sunshine was rare but lovely yesterday, wasn’t it? not here until much later. Still winy and cold. I loved this little glimpse at your day, and went with you on the journey along the English verdant lanes. I was on Skype to Norway yesterday helping my 10 year old granddaughter choose an outfit to wear for a wedding in England this summer. We chose her dress, her bolero and her hairstyle – lots of fun and grandpa was involved too. It’s one of life’s pleasures, choosing an outfit for a young lady, isn’t it, Rosemary? 🙂 Maddie is back in the outfit this morning, doing fashion-model-hair swinging. But what is she doing? 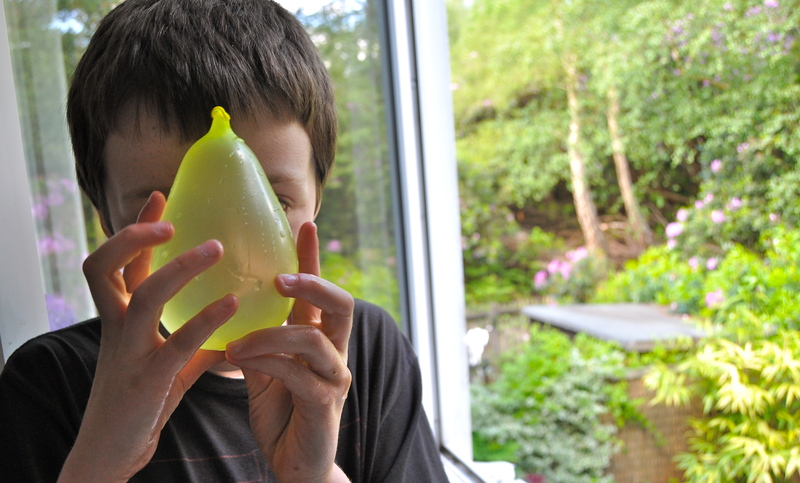 Helping Felix with more water bomb experimenting! I drew the line at permanent pen markers to draw faces on them unless Maddie put on old clothes. It would settle things and keep everyone cool at the same time, Jan 😀 Though this chilly morning it is making me cold just watching them play! I know 🙂 Heart-constricting stuff, Sidey. Spending a few days with my cousin and her daughter, who is very fashion opinionated like Maddie. It is fun to watch Bella put her outfits together. Replying from my phone, I cannot easily find links, but the Calvin and Hobbes water balloon comic is a classic. Felix would really appreciate it right now. I agree wit Banno. Here water bombs are used extensively in festival of colors. How old is your daughter? Eleven 🙂 But still willing to play water bombs in between the hairdos. Her first Senior school party, what a fun day for her, surprised that you didn’t find a way to sneak a peek for a couple of quick photos of her inside the hall. This was her moment, Lou 🙂 Not sure she would have forgiven me if I had taken out a camera! Always enjoy the glimpses you allow into your everyday world; fearsome Felix and the fashionista with a sure sense of how much was enough! Can the SatNav take you to the moon Kate? As a matter of fact, Jim, it can. But I prefer old fashioned ladder, myself. How I remember those dress up time with my girls. One, a princess, the other a definite tomboy. It’s the tomboy that mom to our Kezzie, who already loves dressing up. As to water bombs, Tom made sure the girls had that sort of fun as well. What a delightful glimpse into your lives there, Kate. Enjoy these moments. We will, Penny 🙂 Thank you. What a lovely day with your family.. water balloons and fairy dust.. just beautiful! It was a nice day, Smidge: exhausting, with all the logistics, but there were some great moments. Lovely to have you back! Reminds me of a mother telling of her proud heart aching as her daughter began to spend hours over hair, clothes and make up. 😀 Ingenious, Amy…what a lovely story. It quite gives me heart..
A bright and cheerful day filled with activity – and tinged with a little sadness of a mother watching her children grow. Joy is a stab of longing, as CS Lewis said…. Water bombs! Be warned – boys never outgrow them. Erk. Must keep them away from Phil. I shan’t be sharing that photo of your Felix with mine. He’s enough trouble with the various squirt guns my mother keeps giving him. And I think my favorite part of the story is the afterward, with Maddie back at home the next day, playing at water bombs in her finery. They do, Debra 🙂 This was a particularly magical day of partying!